*This post contains affiliate links at no extra cost to you. Your purchases are greatly appreciated and maintain the blog. My garden is overflowing with zucchini. I harvested three today. We tend to eat so much zucchini that we get sick of it by the end of the summer. There is only so much you can eat fried zucchini. I recently purchased a vegetable spiralizer. Why did I wait so long to invest in this amazingness? 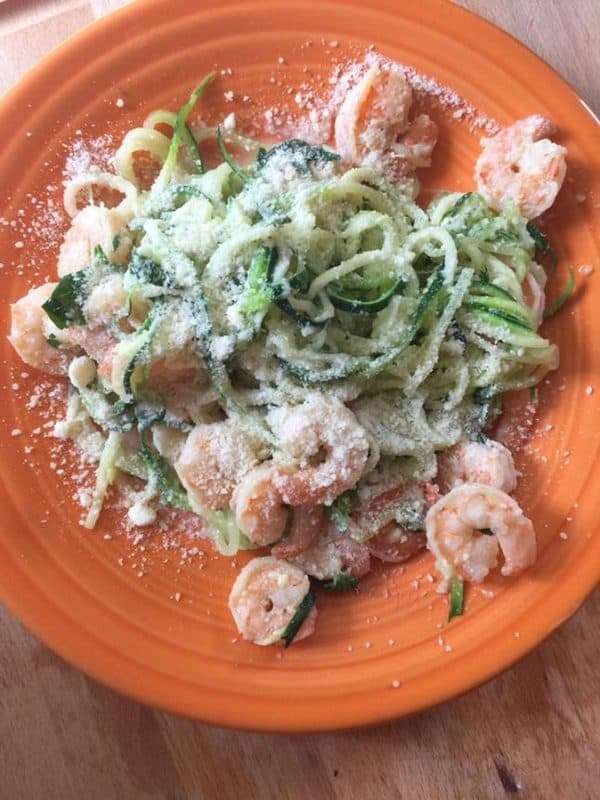 Zucchini makes a wonderful substitution for pasta noodles, with way less carbs. While I don’t abide by any diet that is too low-carb, I know that it is better for my blood sugar. Plus, it’s green noodles – isn’t that fun? I have trouble getting my kids to eat vegetables. I know I’m not the only parent who struggles with this! My middle child loves shrimp, and he was willing to sample the zucchini. That is a win for this mom! Next, I want to try it with regular spaghetti sauce. An easy and healthy dinner (or lunch) dish! Unthaw your shrimp in warm water. Using your spiralizer, create noodles from your two medium sized zucchinis. You can use more or less, depending on how many people you are feeding. If the zucchini is too large, you may want to peel it first because it tends to have firmer skin as the fruit gets larger. Put the butter into the pan and let it melt. Add in your zucchini and let it cook for two minutes, stirring. Season with the garlic, salt and pepper. Add in the shrimp and let cook for three minutes. You don't want to overcook the shrimp; it will become too chewy! After the shrimp and zucchini noodles are cooked thoroughly, remove the pan from the heat. Stir in the parmesan cheese. Sounds so fresh! I love this dinner for dining alfresco on the deck in the summer. I have been wanting to try this. You make it look so easy. Shrimp and veggies stuff I love and my kids will eat as well. Recipes are my thing and this one looks incredible! I recently received a spiralizer and it has changed my life in the kitchen 🙂 looking forward to trying this recipe. Looks delicious and simple to make. I look forward to trying this recipe. Thanks for sharing! Wow! So easy and looks delicious! Will have to make this one day for dinner! I wish I could leave work and make this now! I recently purchased a spiralizer, and it’s life-changing! Looking forward to trying this recipe soon! I love our spiralizer. There is so much you can do with it. Ours came with different sizes and shapes for slicing. I’ve been wanting to try the zucchini noodles. This looks perfect to try. Thanks for this. Yum!! It’s so simple and budget-friendly as well. This is something my daughter and I would enjoy together. The guys not so much. Thinking this would be a great dish to make for our next girls get together. My husband was apprehensive at first – zucchini noodles?! But, he was pleasantly surprised! I can’t wait to try this recipe! I’m trying to incorporate more veggies into my family’s diet and this recipe is a great way to do that! We love pasta so this is a nice substitute. I always look for ways to include more veggies. My kids don’t eat nearly enough! This looks so delicious, I love shrimp, it’s one of my favorite meals. Shrimp is one of the few meats I can get all of my kids to eat, so it’s a favorite here. This recipe looks so delicious, I love the idea of zucchini pasta, I will definitely be trying! I hope you love it! It’s truly delicious – and healthy. This looks delish! I am so jealous that you have so many zucchini in your garden! I feel like my zucchini come on fast, then leave just as quickly… but for those few weeks, we eat zucchini all the time haha! This looks delicious! I don’t eat pasta anymore because zoodles are amazing!! Thanks for another idea for zoodles! I’ve never heard them called zoodles, but I love that! 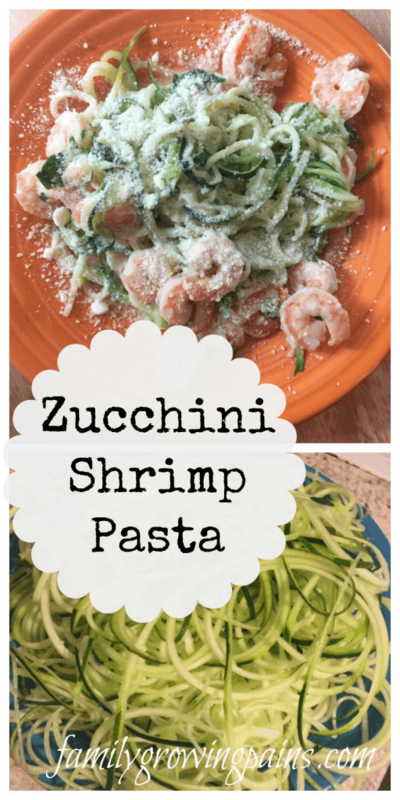 I love shrimp, zucchini and cheese – so this is the perfect recipe for me! Thanks so much for sharing this quick and easy meal idea! It’s so easy! The “hardest” part is spiralizing, but that only takes a few moments. You can spiralizer a lot of different veggies! I love finding recipes that are yummy and healthy! Great ideas. I love zucchini noodles…if only I could convince the rest of my family. This looks so yummy that I will have to make for lunch for me soon!